The improvements in random access memory that have driven many advances of the digital age owe much to the innovative application of physics and chemistry at the atomic scale. Accordingly, a team led by UNL researchers has employed a Nobel Prize-winning material and common household chemical to enhance the properties of a component primed for the next generation of high-speed, high-capacity RAM. 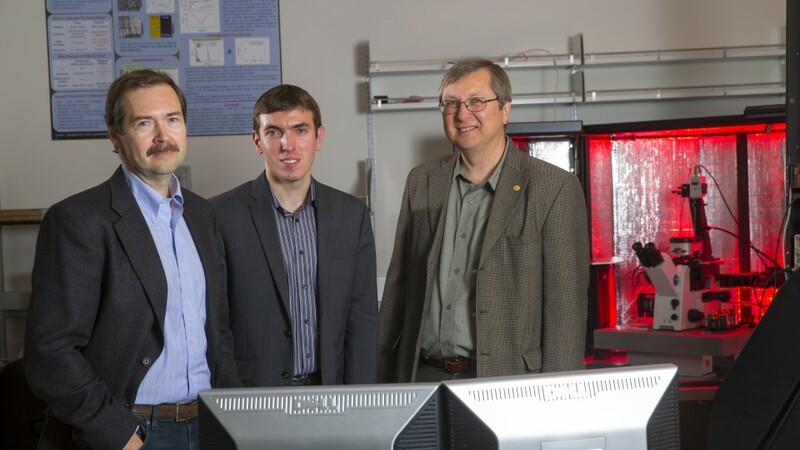 The team, which published its findings in the Nov. 24 edition of the journal Nature Communications, engineered and tested improvements in the performance of a memory structure known as a ferroelectric tunnel junction. The junction features a ferroelectric layer 100,000 times thinner than a sheet of paper, so thin that electrons can “tunnel” through it. This layer resides between two electrodes that can reverse the direction of its polarization — the alignment of positive and negative charges used to represent “0” and “1” in binary computing — by applying electric voltage to it. The researchers became the first to design a ferroelectric junction with electrodes made of graphene, a carbon material only one atom thick. While its extreme conductivity makes graphene especially suited for small-scale electronics, the authors’ primary interest lay in how it accommodated nearly any type of molecule — specifically, ammonia — they placed between it and the ferroelectric layer. A junction’s polarity determines its resistance to tunneling current, with one direction allowing current to flow and the other strongly reducing it. The researchers found that their graphene-ammonia combination increased the disparity between these “on” and “off” conditions, a prized outcome that improves the reliability of RAM devices and allows them to read data without having to rewrite it. “This is one of the most important differences between previous technology that has already been commercialized and this emergent ferroelectric technology,” said Alexei Gruverman, a Charles Bessey Professor of physics who co-authored the study. Ferroelectric materials naturally boast the quality of “non-volatility,” meaning they maintain their polarization — and can hence retain stored information — even in the absence of an external power source. However, the infinitesimal space between the positive and negative charges in a tunnel junction makes maintaining this polarization especially difficult, Gruverman said. Gruverman said the team’s graphene-ammonia combination also shows promise for addressing this prevalent issue, significantly improving the stability of the junction’s polarization during the study. Gruverman’s UNL co-authors included Haidong Lu and Dong Jik Kim, postdoctoral researchers in physics and astronomy; Alexey Lipatov, a postdoctoral researcher in chemistry; Evgeny Tsymbal, George Holmes University Professor of physics and astronomy; and Alexander Sinitskii, assistant professor of chemistry. The study was also authored by researchers from the University of Wisconsin-Madison and the Moscow-based Kurnakov Institute for General and Inorganic Chemistry. The team’s research was conducted with the assistance of UNL’s Materials Research Science and Engineering Center — part of a nationwide network of MRSECs sponsored by the National Science Foundation — and also received support from the U.S. Department of Energy. Nature Communications is the Nature Publishing Group’s multidisciplinary online journal of research in all areas of the biological, physical and chemical sciences.